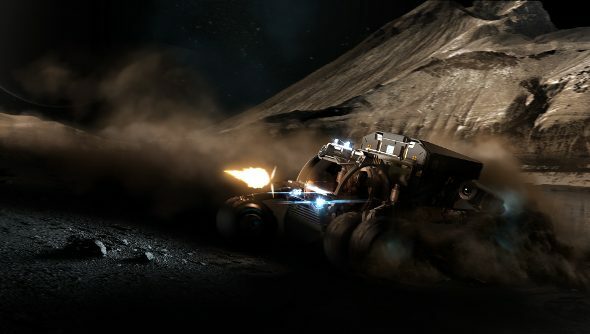 As if I couldn’t be any more excited about the prospect of touching my Eagle down on a rocky planetoid and exploring the planet’s surface, David Braben has only gone and released some new in-game footage that gives us a taste of what’s in store once Frontier’s work is finished. The footage is completely raw and unedited, captured from debug code on a developer’s machine. It shows us a surface vehicle parked in the dust, a nearby star looming on the horizon. Want to know what other plans there are for the for the future of Elite: Dangerous? Check out all the new features that are coming in the Elite: Dangerous Horizons update. Using the debug camera, we zoom out faster and faster from a crash site on the ground, eventually showing the rocky, potato-shaped planetoid in its full glory. There’s still a lot of work to be done, with little details that need tweaking or fixing, but this gives an idea of the scale and spectacle of manually landing your ship and exploring the surface on arrival. Just be sure to put aside ten days to drive around each planet’s circumference.